(CNN) -- Jose Mourinho has extended his contract at Serie A champions Inter Milan by 12 months until June 2012, killing off speculation that he could be on his way to Real Madrid. 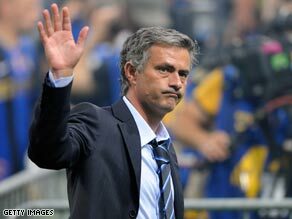 Coach Mourinho has signed an extended deal ending fears he could wave goodbye to Inter Milan. Former Chelsea supremo Mourinho took charge at Italian giants Inter a year ago following the departure of Roberto Mancini and has just guided the club to their fourth straight scudetto. They also won the Italian Super Cup, but were eliminated by defending champions Manchester United in the first knockout round of the Champions League. A statement on the Inter Web site read: "In response to the wish of the coach to continue the project started together a year ago, a wish welcomed with pleasure by the club as a sign of attachment and winning spirit, FC Internazionale announces the extension of Jose Mourinho's contract until 30 June 2012." Mourinho had promised the fans more titles would be on the after lifting his first Italian title, but the eal issue refused to go away until Monday's statement. When asked about the chance he could leave Inter, Mourinho had earlier told the club Web site: "There is still a 0.01% (chance). But for me this is not an important number, it just means that I am closer to Inter than to Real. "I am satisfied with the relationship with the fans and with my players. I repeat, I am closer to staying at Inter than going elsewhere." Those comments failed to impress Inter president Massimo Moratti, but the extended contract has settled any differences. Mourinho made his mark at Porto in 2004 when he led the Portuguese team to the Champions League title, beating Monaco 3-0 in the final, before moving to Chelsea. At Stamford Bridge he claimed the Premier League title in each of his first two seasons and the FA Cup the following campaign, but left the club in September 2007. Not all Inter fans have warmed to the Portuguese since his arrival in Milan last summer. He has been involved in several disagreements with the Italian media and his style of play has has not endeared him to parts of the Nerazzurri faithful.